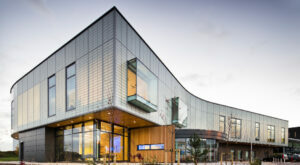 The University of Sheffield Advanced Manufacturing Research Centre (AMRC) is at the cutting edge of materials research in the UK and provides bespoke research centres. AMRC’s innovative new facilities, in partnership with companies such as Boeing, Rolls Royce, Airbus and BAE Systems, have attracted much attention – but has most recently caught the eyes of luxury, high-performance sports car manufacturer McLaren. Keelagher Okey Klein have provided Principal Designer and CDM Advisor on multiple AMRC new-build project however one project in particular had its official launch on 16th January 2018, exhibiting a first glimpse of the exciting automotive technology partnership between AMRC and McLaren: the McLaren Composites Technology Centre (MCTC). 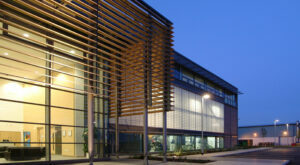 KOK provided Principle Designer and CDM Advisor services on the construction of the MCTC building itself but also performed the role of Principal Contractor on the fit-out of specialist plant and equipment within the MCTC as part of the Lightweighting Excellence (LX) programme. KOK’s specific involvement with the fit-out was that of a bespoke Press, which stands at six metres high by seven metres wide, allowing it to make several components at a time, using High Pressure Resin Transfer Moulding (HP-RTM). The Press is a world-first in terms of its size, capabilities and the level of monitoring and control it provides. This impressive equipment will be used to develop and manufacture carbon fibre chassis used in McLaren sports cars. 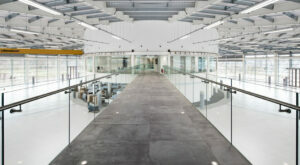 See our Case Study on the AMRC: https://kok-surveyors.co.uk/amrc-university-of-sheffield/ for more details on KOK’s involvement in the construction of AMRC facilities.